Here you find a summary of available infrastructure in the city, with data on transport, services and industry. Rio Negócios can help you use that structure to your favor. The port of Rio presented an average growth of 20% in passenger volume over the past 13 years. Source: ANTAQ, National Agency of Waterway Transportation and Ministry of Tourism. Note: *TEU - twenty foot equivalent unit. Unit of measurement of a container's capacity. The movement of passengers in the two main Rio airports in 2013 was equivalent to four times the city's population. ¹Source: INFRAERO, Brazilian Airport Infrastructure Company. Superintendence of Planning and Management - PRPG. In 2012, the number of passengers passing through the Galeão International and Santos Dumont airports had grown 14% and 8% in two years. ¹ Finger is a term used by Infraero and it is synonymous to jetway or airbridge. Note: Heliports registered with the Air Force only. Source: ROTAER - ICA (Air Force Cartography Institute). Source: Light Serviços de Eletricidade S.A./ IPP (population projection). Note: (1) - Includes the following categories of electric power consumption: residential, industrial, commercial, rural, government, public illumination, public service and own consumption. Source: (Brazil) - National Agency of Electrical Energy, ANEEL. Available in: http://rad.aneel.gov.br/ReportServerSAD?%2fSAD_REPORTS%2fConsumidoresConsumoReceitaTarifaMedia-ClasseConsumo&rs:Command=Render acesso 15-03-2012. (Rio de Janeiro) - Light Serviços de Eletricidade S.A./ IPP - Data Warehouse. Note: (1) - Included in the Public Service category are: water, sewage, sanitation and electrical traction. Source : Ministry of Cities - National Secretariat of Environmental Sanitation - National Information System on Sanitation, SNIS. Available on http://www.snis.gov.br. Access on 3/19/2012 - Data made available by CEDAE (Rio de Janeiro). Notes: (1) - Average value for serving of urban population. Source : Ministry of Cities - National Secretariat of Environmental Sanitation - National Information System on Sanitation - SNIS - Available on http://www.snis.gov.br. Access on 3/19/2012 - Data made available by CEDAE (Rio de Janeiro). Note: Water volume consumed - Annual water volume consumed by all users, including the micromeasured volume, the estimated consumption volume for connections without water meters or with an inactive water meter and the volume of treated water exported. 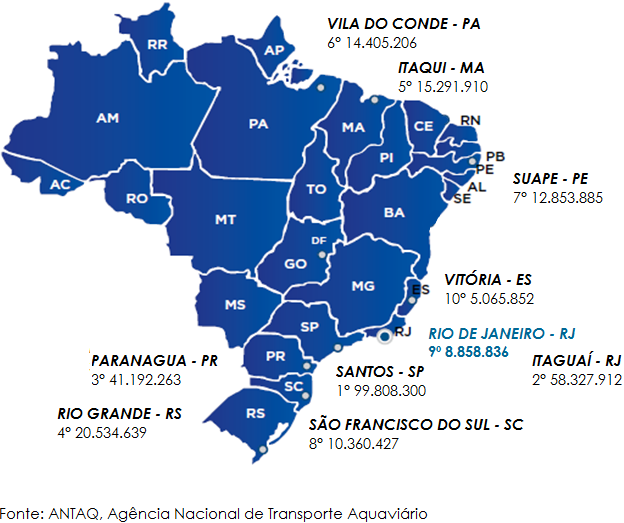 Source : Ministry of Cities - National Secretariat of Environmental Sanitation - National Information System on Sanitation - SNIS - Available at http://www.snis.gov.br. Accessed on 3/20/2012 - Data made available by CEDAE (Rio de Janeiro). Note: Economy - Houses, apartments, commercial units, offices, industries, public agencies and alike, existing in a specific building, which are served by the water supply and/or sewage systems. Accessed on 3/19/2012 - Data made available by CEDAE (Rio de Janeiro). Note - The calculation base for the estimate of the annual sewage volume released into the collection network considers, on average, 80% to 85% of the water volume consumed in the economies. Source : Ministry of Cities - National Secretariat of Environmental Sanitation - National Information System on Sanitation - SNIS - Ranking de Saneamento 2009. Available at http://www.snis.gov.br. Accessed on 3/19/2012- Data made available by CEDAE (Rio de Janeiro). (1) Based on 81 cities in the country. Rio de Janeiro has 96% of its passenger traffic concentrated in road transportation. Barcas S.A.; Companhia de Navegação do Estado do Rio de Janeiro - CONState of Rio de Janeiro; Brazilian Airport Infrastructure Company - INFRAERO. Source: ANATEL. Available at http://sistemas.anatel.gov.br/sgmu/ - Last access on 2/20/2012. (1) Installed lines is the total formed by all the fixed lines that have all the necessary facilities to be in service. (2) Lines in service are the installed lines that are placed at the disposal of the users, including public use terminals (TUP). Notes: (1) Teledensity Calculation - Pereira Passos Municipal Urbanism Institute - IPP. (2) IBGE, Monthly projections of Brazil's population until November 2010. " Notes: (1) Installed lines is the total formed by all the fixed lines that have all the necessary facilities to be in service. (2) Lines in service are the installed lines that are placed at the disposal of the users, including public use terminals (TUP). Rio de Janeiro has a teledensity of 47 lines per 100 inhabitants, much higher that the Brazilian average of 21 fixed lines available per 100 Brazilians. (1) Teledensity Calculation - Pereira Passos Municipal Urbanism Institute - IPP. Source: Teleco, Intelligence in Telecommunications. http://www.teleco.com.br. Note: Cell phone density = cell phones per 100 inhabitants. Available at: http://www.teleco.com.br/ncel_hist.asp. Time: 11:24 on 3/20/12. Source: Teleco. Statistics on Brazilian households. Available at: http://www.teleco.com.br/pnad.asp. The City of Rio de Janeiro offers 28,380 hospital beds in 3,749 Health Units. Note: Health Unit (aggregates all the existing categories, from Clinics to Hospitals). Complementary: Intermediate Unit, Isolation Unit and Adult, pediatric, neonatal ICU, and Burn Unit. Other Specialties: Chronics, Psychiatry, Rehabilitation, Pneumology, Care of Minors. Hospital DIA: Surgical/Diagnostic/Therapeutic, AIDS, Post-Transplant Care, Geriatrics, Mental Health. The city of Rio de Janeiro has the largest proportion of teaching hospitals in Brazil.